It’s October, but I’m feeling tropical and this dessert is just what I had in mind. After a few days of rain and chill, we are finally having a sunny fall day here in the Northwest. 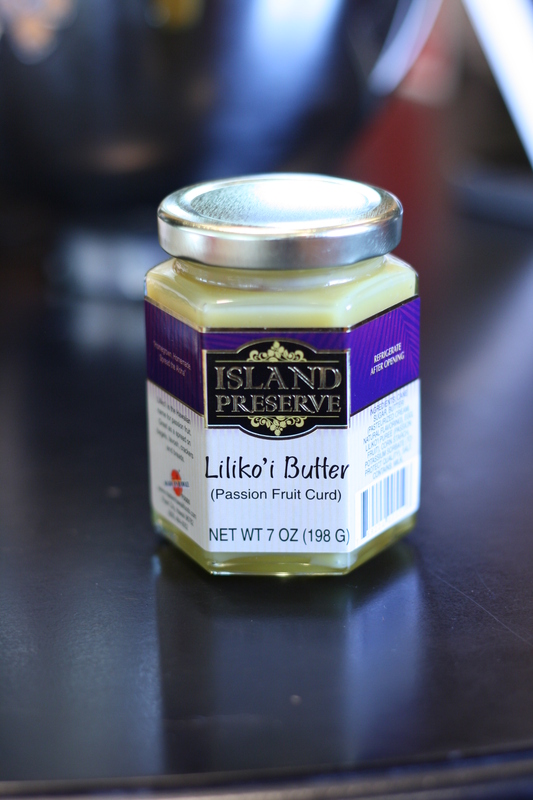 Passion fruit or Liliko’i as it’s called in Hawaii is one of my favorite tropical flavors. Have you had the passion fruit Chobani yogurt?? If not, try it…..Today! It’s my favorite, I know some of you don’t like the crunchy black seeds, but I can deal with the seeds for that burst of Hawaiian flavor. These mini cheesecake parfait were inspired by this recipe and are no bake, so they are easy to whip up for a quick dessert. 1. In a food processor, pulse graham crackers to a fine meal. 2. Place in a bowl and add melted butter. Mix with a spoon. 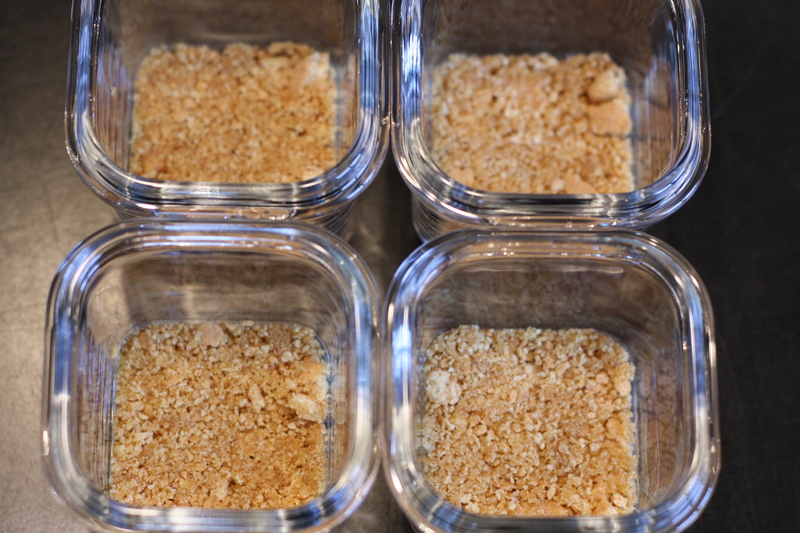 Place about one tablespoon of graham cracker mix into your small parfait cups and press firmly into bottom. 3. In an electric mixer beat cream cheese and mascarpone cheese until creamy. Slowly add sweetened condensed milk, continue mixing. Lastly, add vanilla and beat until smooth and creamy. 4. 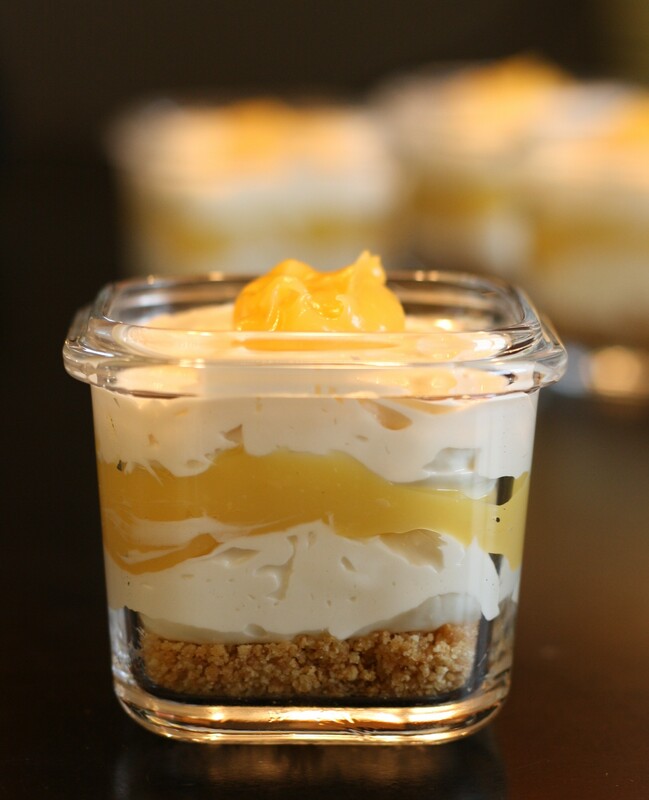 Layer cream cheese mixer into parfait cups, followed by a layer of the passion fruit curd. Add another layer of cream cheese mixture and finally add a dollop of passion fruit curd on top. 5. Let chill in the refrigerator for 2-4 hours prior to serving. These mini cheesecake are so versatile, you can substitute any fruit or topping for the passion fruit layer. Plus they look so pretty with the various layers. I used these small containers for my parfait cups and love them because they have lids, so they store well in the refrigerator and are perfect for packing in lunches or for a picnic. 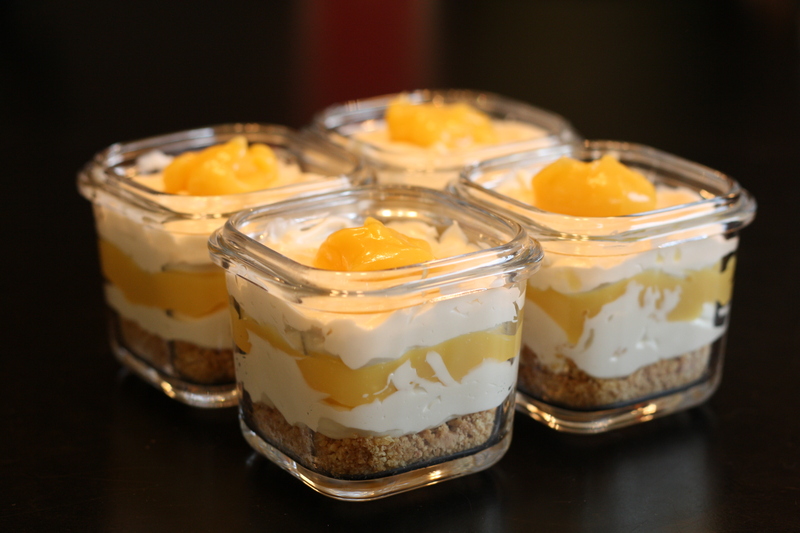 This recipe made plenty of the cream cheese mixture, you could easily use larger parfait cups, those pictured above are only 4 ounces. I’ll use the leftover cream cheese mixture for something else or just eat it by the spoonful from the fridge. On the fertility front, I’m still on birth control. I’ll be starting back up on meds later this month-Lupron, dexamethasone, baby aspirin, Estrace and later progesterone in oil after the frozen embryo transfer. I’ve actually had many days lately that I haven’t dwelled on my infertility and the fact that I’m still baby less. I’m sure I’ll start focusing on it again as I begin preparing for our last FET (under Attain program). Next weekend I’m attending a baby shower for a dear friend who is expecting twin girls after a long struggle with infertility. She is my soul sister and I know if she can get there, things aren’t impossible for me. She gives me hope. I’m hoping to get to a pumpkin recipe soon, I haven’t had a chance to post recipes as often as I’d like. Being a business owner has definitely taken a toll on my time in the kitchen. But I love fall and can’t wait to enjoy some fall inspired recipes. What are you cooking and baking right now?! I love a parfait! One of my favorite treats! Those containers are super cute, love the colorful lids! The containers are actually baby food containers, but I thought they would be perfect for mini parfaits!